Do you use an ultra-mobile PC (UMPC)? I'm not talking about those tiny netbooks that you see at Best Buy. I mean a touch-screen tablet that you can carry in your pocket. 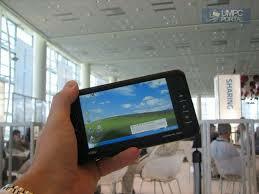 Tiny tablets are becoming more popular in the healthcare industry. I love my OQO, but I fear that the company may not be here much longer. What will I do if I can't carry a full PC in my pocket? The Viliv S5 Premium may become the OQO replacement for those of us who have an OQO model 02. From a distance, it looks like the model 02. However, it's not a slider and it doesn't have a built-in keyboard. The Viliv S5 looks like a solid little device, but who's heard of Viliv? Viliv is a Korean company that creates ultra-mobile PCs like the S5 which fits in the palm of your hand. Would you pay $599 for this computer? You won't find it at Best Buy, but you can get one at Dynamism. This little computer has generated a lot of buzz recently and it may be a great little mini table for those of you who need a full PC but don't need a small built-in keyboard like those found on netbooks.